Many people don’t understand that, despite trappings of modern civilization that buffer us from this reality, we are in direct competition with wildlife for our existence. Not only have we lost sight of this fact, but we have also begun to believe that there is a way to ‘live in harmony’ with nature and we work hard to convince ourselves this is achievable. If you are one of these people, then you are wrong to think this way and here’s why. Everything out there is trying to make a living just as we are, from the bears, to the fish, to the squirrels, to insects, and bacteria. Since humans have walked on this earth we have been in direct competition with nature for resources and thus have fought to protect these resources. If we weren’t successful, we starved. Historically, humans hunted for our food and thus we understood our direct relationship with the natural world. We understood that if the wolf population was too high the deer numbers would be low and this would threaten our chance of survival. Consequently, humans understood we needed to kill some wolves in order to protect the deer numbers and, in this way, indirectly protect our own species‘ survival. We understood we were, and must be, part of that equation. Today, every time we spray our lawns with insecticide, every time we build a new home, each time we pave a road, each time we build a shopping mall or a university, each time we fell trees to make lumber, every time we fill our gas tank, every time we buy some product that has been shipped half way around the world, every time we buy packaged food from the grocery store, and so on, we displace and destroy (or already have replaced and destroyed) the native plants, insects, birds and animals — and the resources they depend upon for their survival — that previously existed in the are area in question for our benefit. Today however, few people would recognize the environmental cost to changing a track of forest into agricultural land and the inputs necessary to raise a cow, or a pig, or even an acre of soybeans to grow food for humans. Few would understand that it is environmentally more sound to keep the forest in tact and harvest a moose who is perfectly suited to that forest and requires no artificial inputs, let alone be willing or able to make the lifestyle changes necessary to manage that resource. Only those who can afford food can ‘afford’ to entertain this false belief system. Few people in North America today rely on hunting or raising food on their own land for their direct economic survival. Instead, we have accepted that large swaths of nature should be severely altered (if not completely destroyed) in order that we can live in city suburbs, and that agricultural (and other) products can be made cheaply and can be transported long distances to us. So it is not that we are no longer directly in competition with nature, rather that the competition is out of sight and out of mind. We are no longer aware of it because we don’t see direct evidence of it on a daily basis. California’s bears and other flora and fauna have been displaced and/or all but been destroyed, its landscape severely altered to make way for suburbs, highways, orchards and market gardening, and its waterways re-routed for irrigation, as have the Okanagan and Frazer Valleys in British Columbia, great swaths of the prairie provinces across Canada and the USA, and the Niagara region of Southern Ontario. These areas are some of the major agricultural production areas on which we North Americans depend most for our food production and, therefore, survival. That these areas were once wild, and remain domesticated only by force and vigilance, is an idea forgotten or ignored only by those who can afford to buy food instead of growing it themselves (provisioning). It is only those whose economic livelihood is not threatened, those who live an indirect economic lifestyle by selling their time for a wage so they can buy food, clothing, housing, etc., for their (indirect) survival, who can afford to uphold the misconception that we are not in direct competition with wildlife for our existence. We all are in competition with nature, even urban dwellers. Ironically, it is urban dwellers who are, not only the most food insecure because they are more dependent upon an agricultural production and distribution system that is completely out of their control, but also often the most unaware of how much competition they are in with nature for their survival. How many urbanites consider the tons of pesticides that are sprayed annually on wheat alone to keep the average crop from succumbing to weevils? While weevils are not bears, they too compete directly with us for our wheat! Which brings me to two other important points about direct competition. We have developed strategies for competing with all aspects of nature, from traps (mice and rodents), to fungicides, herbicides, insecticides (molds, weeds, bugs), to windbreaks and rip-raps (erosion by wind and water). We have become so conditioned to these agricultural weapons that we no longer see them as such. We certainly don’t see weevils on par with squirrels, or squirrels on par with grizzly bears. Many bear enthusiasts would not object to a farmer spraying crops to prevent weevils from destroying it but would be horrified if the same farmer shot a bear to protect his apples. However, if you were dependent upon the apple crop for your livelihood, or to keep you from starving, you wouldn’t. The privilege of a full stomach affords us the luxury of seeing these two actions as vastly different. Today, most North Americans would tell me to go buy the apples from the store and save the bear because they are no longer engaged in direct economics and can afford to be blindly unaware of the cold hard realities of what it takes to put food on their tables. If you have a stomach full of food bought from the grocery store, then you can afford to see squirrels, deer, hawks, and bears as part of the wonders of nature and feel ‘privileged’ that they are traipsing through your yard and let them eat your berries, apples, and carrots. But even then, there is a big difference between tolerating squirrels, deer, and hawks, and tolerating bears and other large predators. Squirrels can’t kill you but large predators can. In order to keep our yards and communities safe, we cannot tolerate large predators in our human settlements, period. However, if you are dependent upon the food you raise for your economic survival (directly or indirectly) you cannot even afford to let the squirrels eat your strawberries or the deer eat your apples. Imagine that every time a deer came in to your yard you lost 1/3 of your annual wage. How long would it take before the joy of seeing a deer to wear off? How long could you ‘afford’ to feel privileged at losing 1/3 (or more) of your annual salary? In order to have food security, you must have the right to defend the food. In short, humans have a right to livelihood. By that I mean the right to grow food instead of selling our time, collecting a wage, and then spending it at ‘the store’ (where cheap food magically appears). We therefore have the right to defend our food sources just as we did in the past. Salaried employees don’t lose wages when a bear comes through their yards, why should a provisioner or farmer? Some will argue that that should be part of the cost of ‘doing business’ as a farmer. Many will argue that I (and other farmers) should buy electric fencing, install bear proof feed bins, build bigger, stronger, bear proof chicken houses and so on in order to prevent the bear conflict. I am against this line of thinking for three reasons: this argument is based on false belief #1 (that humans can control bear behaviour by removing all attractants); there is little enough (if any) profit to be made in farming these days and the additional cost would make their products out of reach for many consumers; and finally, fencing out large predators and leaving them to roam the neighbourhoods around fence lines does not promote human safety. If we want sustainable farming to be something that younger people choose as a career, if we want food security for our communities, if we want to have agricultural animals raised ethically and humanely, if we want good clean safe food, if we want the right to livelihood, then we have to support those who are willing to do the work and make it worth their while. Otherwise, we will have to accept that those farmers who could get well paying, secure jobs elsewhere, should get them; that we will have food insecurity; that we will give up our right to livelihood; and that we will have to rely upon the corporate agricultural production and distribution system. Finally, because we all need to eat and that act displaces large tracks of wilderness in order to ensure our survival, then the cost of maintaining wilderness with its full compliment of flora and fauna, in parallel with local food security, should be borne by all society, not just those who choose to live close to the wild and raise our food. Compared to previous years, it has so far been a summer free of bears here in the valley. Friends visiting have been disappointed to see none on the hour long drive from the foot of the hill down the valley to our community, and I’ve heard of no home or chicken shed invasions since late spring. One theory is that this summer’s forest fires have spooked them all back up the side valleys; if that’s the case, maybe we should organize for a controlled burn every spring! Not that there haven’t been close encounters. My own was in July, when my dog was more than usually vocal one night. Usually she’ll bark off an intruder once or twice a night, while I lie in bed judging the size of the attacker by the distance Tui moves away from the house towards the perimeter fences. If I hear her echoing against the forest in the distance, it’s a fox, while if she stays close to the front porch and whines, it’s a cougar. This night it was an in-between barking distance so I knew it was a bear, whose size I didn’t know until dawn when I went out to free the turkeys, laying chickens and meat birds from their respective barns. The stucco wire fence and gate adjoining two of them had been broken down, probably with one swipe of a massive paw, dragging a rail along with a six inch nail away from a wall (see photo). He or she (I suspect it was a she as each year I meet a mama grizzly in our yard with her cubs at some point) was probably excited by the smell or sound of our turkey flock, several of whom perch on the open window sill behind stucco wire, to take advantage of some cooler night breezes. If the bear had been insistent (as we had seen on other properties) our plywood walls would not still have been standing, but they were. I walked thirty meters along the fence line to the forest edge, the bear’s normal trail and entry point into our property, and sure enough, there was the flattened trail in the same place as previous years. I began taking my windfall apples and dumping them there as peace offering, but they haven’t been touched in three weeks. This hot summer has meant a good year for wild berries, and now the creeks are full of writhing salmon, so we may be spared any bear predations this fall. Nevertheless, it would be foolish to give myself or you the impression that the bears aren’t around. My friend Clarence told me just the other day that his daughter, who lives across the highway from his place ‘on our side’ (as he put it ominously) stepped out from her back door last week midmorning to confront a grizzly only meters away. And when I went to pick blackberries in Clarence’s patch last week in the last of our heat, I was un-nerved to come across a maze of flattened vines and grasses. I suddenly felt I was in the middle of a vast alfresco restaurant, with various intimate nooks where bears had lain in the shadows and feasted on the berries hanging off the ‘walls’ in all directions. It was strange to think that a giant paw may have recently brushed over the very berries I was now tenderly plucking. Clarence confirmed the fact by complaining that there is a mama black bear and cub that have been frolicking in the blackberry patch “flattening it and making a mess”. David Hall's cougar watches over the Rod and Gun Club annual dinner and dance. Last weekend we held the annual Rod and Gun Club fundraiser dinner and dance. In preparation for the dinner, the members of the Rod and Gun Club prepared the meat they hunted this fall, butchered farm raised food animals, and taxidermied animals for the display. Earlier in the year, I helped Clarence butcher the turkey he planned to donate and also helped his son, David, skin and butcher out the cougar which he recently prepared for the display. The dinner provided me the opportunity to bring my duck breeding venture to a close. I butchered the last of the Muscovy ducks and took them to the dinner. Gary carving the elk, moose and grizzly bear roasts. The vast array of different foods there was surprising given the small community and was a testament to the amount of ‘industry’ the people in this valley are involved in. I could have tried every kind of meat on offer but managed to limit myself to what I could fit on the plate and still be able to remember which meat was which by the time I got from the smorgasbord back to the dinner table. On offer was nearly everything one could imagine and then some: deer, moose, caribou, elk, wild boar, duck, turkey, beaver, llama, black bear, grizzly bear, and of course, David’s cougar. He presented it freshly roasted as well as smoked sausage and hams. Animals of hunting trips past on display at the game dinner and dance. I tried everything except the caribou and beaver. I had tried caribou before and the beaver just wouldn’t fit anywhere on the plate by the time I got to it, though it did look delectable having been made up into a beautifully presented stir-fry. I was surprised to see that the dinner even catered to vegetarians, with salads of various kinds and several versions of tofu, vegetable stir-fries and bean dishes. I also took a home made loaf of bread and others had made rolls and biscuits. The meal was scrumptious and most of us ate far too much, but I did manage to save room for dessert! What struck me most about the dinner, besides the fact that it was such a unique example of local culture and something particular to this valley, was the fact that the vast array of meats differed little from each other. I was expecting to notice a greater difference in texture and taste between the carnivorous animals and the ruminants. My favourite meat was the elk, with the cougar and the grizzly bear roasts tied for second place. So similar in taste and texture were most meats that I’m certain I could feed my mother a grizzly bear roast and tell her it was beef! Of the options I sampled, the animal that had the most distinctive taste was the llama. The Rod and Gun Club puts on this dinner and dance every year to raise money for the club and to raise awareness of hunting and animal conservation. Many would find it curious, if not ironic, that the hunters in this valley are some of the most aware of conservation and environmental issues and the most active people in terms of environmental conservation and preservation of animals. They are by far the most knowledgeable bunch of folks I have ever had the pleasure of learning from about the complexities of the natural world around us and the balance of nature. These cougar tracks were made in front of the Fish Hatchery buildings. The day before yesterday, two hunters ‘let the games begin’, and came out winners. Not only have we been victimized by marauding bears this week, but also there has been a cougar, as one neighbour succinctly put it, “terrorizing the neighbourhood”. The cougars ‘games’ began several weeks back when it killed and ate several pet cats, attacked at least two dogs and killed one (that I know of). It has also been feeding on deer from the wild, and was finally spotted again two days ago. Thankfully, cougar hunting season is open and a couple of hunters took up the challenge and started tracking the cat. The first couple of times, it led them through people’s barns, yards, and even through someone’s shop (and the people hadn’t known it was there!). In the end, the the daylight hours proved too short and the cougar too elusive. The alarm was raised in the morning when a hatchery worker arrived at work and, spotting the tracks in the snow all around the buildings, immediately notified the hunters. It led the men on a merry chase for several hours in the worst of conditions we’ve had this winter: bitter cold, extreme slush, lousy footing, and icy streams. It led them across several streams (they broke through the ice up to their crotches), then back and forth several times until their dogs finally treed the cougar just beyond the airport, not far from my house, and they shot it; it was a healthy adult male, weighing in at 128 pounds. I worry for my animals every day, and I’ve lost lots of them to the various species of resident wildlife. When a cougar is on the prowl, I worry about my goats and dog especially. But what is a girl to do? On the one hand, it is good to leave my dog out because she is my ‘early warning system’ and, for an inexperienced cougar, possibly just enough of a deterrent to make him change his mind. However, the reality is that she is no match for a determined cougar and so she may lose her life if I let her stay outside–even during the day (dogs here are often referred to as ‘cougar bait’ because so many are taken each year). Cougars are getting more and more bold here in the valley, and we are the worse off for it. Not only have they taken dogs from yards; they have begun taking them right in front of the people walking them, and, on at least one occasion, while one was still on the leash! To date they have killed our pets and attacked adults, severely injuring them, and I fear for our school children who walk to school and play on the school grounds during recess (two cougars were spotted on the Native school grounds last year). Is this any way to live? When discussing our problems with cougars the other night, the Conservation Officer (who had been dispatched from Williams Lake to deal with our chicken-killing marauding bear) told me we shouldn’t fear cougars. Instead, he said, we should respect them. I felt like saying, ‘Tell that to Cindy Parolin’s family, or to her son, who was attacked first by the cougar, and whose life she was defending when she lost hers, because the cougar killed and half ate her alive before someone shot it.’ Or say that to the myriad other families who have lost loved ones to cougars (or bears), sometimes in their own backyards. If I don’t have to fear cougars, why have there been these deaths? Why does all the literature on cougars (even from our own Ministry!) advise us to defend ourselves strenuously if attacked. It warns us not to play dead because, unlike non-predatory type bear attacks, when a cougar attacks it intends to kill and eat you. Cougar attacks are always predatory, yet this man, whose job is to serve and protect the public, believes we shouldn’t fear them? Puh-leeease. The cougar I no longer have to fear. Most people in the valley who hear that kind of statement laugh at the ridiculousness of it. Why? Because they know what a cougar can do to you. The doctors and nurses here know what the cougar (and bear) injuries look like. They know that it only takes 4.5 mins for someone to bleed out if a jugular vein is cut by a claw or fang. Not only that; they are acutely aware of the severely limited operating capacity of our remote hospital. They know just how lucky the few who have been attacked were, to get away with their lives. In addition, the people here know that there has been a recent change in cougar (and bear) behaviour, and that the new Ministry of Environment policies outlawing the hunting and trapping of cougars and bears as a preventative protection measure are at least partially responsible (and likely the major contributing factor) for the change in predator behaviour. Unfortunately, the majority of our population now resides in cities, and this majority is creating the policies that us rural folk have to live with. The sad thing is, even though many people have lost their lives because of this thinking, the rules and legislative policies are still not changing. Our society is running an incredibly dangerous experiment by presuming we can ‘live in harmony’ with wildlife. We can’t, never have, never will. It’s a dangerous fallacy and a ridiculous fantasy. Over the past few weeks, my neighbours had a collective loss of all their chickens, several turkeys and many ducks, to marauding bears. By the grace of God, my chicken sheds still stands unharmed and my chickens unravaged (however, I did lose the last of my female Muscovy ducks to a fox two nights ago). Two days ago, I ran into Clarence while out for lunch and he invited me to go with him to survey the damage that a bear had wreaked at a friend’s place two nights before. He wanted to read the signs and understand what happened: he would reveal the story while I recorded and photo-documented the scene. As we approached the chicken shed we passed through Glady’s orchard. As Clarence surveyed every inch of the snow he described what he thought had taken place. Because of the size and shape of the footprint, he realized it was a full grown adult grizzly bear, while the pile of carcasses told him it was planning on returning. Like a butcher, the bear first cleans out the guts to preserve the meat for when she returns. The proximity of her chicken shed to her house tells me it's a bold bear. Clarence concluded that on the south side of the shed (photo above), the bear actually had the smarts to slide the plywood open and then tear through the heavy wire to get at the chickens. (Note the proximity of the chicken shed to my friend’s house, which tells us the bears are not afraid of humans.) On the north side, the shed was not so lucky. The bear tore off the plywood covering and wooden slats that held it ,before ripping into the wire. Clarence showed the difference between the claw marks and teeth marks on the wooden walls. North side of shed where the bear ripped apart the 1 x 6 inch wood and plywood covering of the window. Clarence soon determined it was actually two bears because there were two distinct prints in the snow. He reckons it is a mother grizzly and her two year old cub. We followed the tracks and saw the fence they broke getting into the property. They left fur on the wooden fence and barbed wire fencing, too. We found where they had bedded down and eaten some of the chickens. Where the bears bedded down to eat; notice the chicken feathers everywhere. Once we came across the bear bed, the hunter in Clarence almost took over: “I bet they’re bedded down right now within a 100 feet or so…Oh my achin’ back, that trail is hot…that’s an old army expression…wanna walk a ways into the bush with me?” As attractive as that offer was, upon cooler consideration we concluded it would be better that we were both armed before rummaging further afield through the dense forest at dusk in pursuit of the ‘robbers’, as Clarence affectionately called them. In his forty-two years in this valley, he has never observed bears not hibernating at this time of year. Officials will likely say this is because there were not enough fish in the rivers this summer; more experienced people here in the valley tend to subscribe to the idea that this is because we are no longer trapping and shooting the bears, so they are no longer afraid of humans. In the case of these two bears it is probably a combination of both. The bears did come back that night, and for two more nights, to finish off what they’d left behind. Once they were done, they moved on to yet another neighbour and cleaned out her chicken shed, too. Altogether at least seven households have been attacked and their livestock completely wiped out. Normally under these circumstances you could call the Conservation Officer and they might bring a cage up to trap the bear. However, we are presently without a Conservation Officer and had been since June and are likely to be until April (if we are lucky). Our community should have been able to deal directly with this situation by phoning any number of equally qualified and experienced, willing hunter-neighbours. They could have effectively and safely destroyed the bear immediately, either themselves or by using the Ministry of Environment’s bear trap, which sits idle in the snow just across from where I write. (Like the fire and ambulance service, we could have a resident volunteer team ready to go into action; actually we already have the team, just not the permission to act.) But British Columbia’s laws prohibit this kind of common sense approach. Instead, our community had to wait to plead the case to the Ministry which took days, even weeks. Fortunately the bear didn’t decide to enter someone’s house during that time. Until two years ago, I had thought that I could live ‘in harmony’ with nature and wildlife. I didn’t own a gun and didn’t want one. I had the ‘citified’ belief of a newbie to the area that if I didn’t bother the bears, then the bears wouldn’t bother me–ditto for cougars, foxes, etc. However, it is simply not true no matter how much you want to believe it. Everything out there is trying to make a living just as I am. Unfortunately, when you are trying to make a living by raising all your own food, you present a sumptuous smorgasbord to a host of predators. Not only that: if you do as I was doing–let an area of the land or lawn ‘go back to nature’ (as gardening tips in magazines for city-slickers suggest, in order to create habitat and lessen one’s carbon footprint)–what you end up with is just that: habitat. This is a great idea for urban folk and for those living in less wild areas than rural/remote British Columbia. There are wonderful stories of people living ‘in harmony’ with nature in this way: ‘Isn’t it cute to see deer re-populating this valley’; ‘We now have a riot of bird calls in the morning,’ and the like. However, I have come to learn that this idea cannot be applied universally, and certainly not to the conditions in which I live, because what I have managed to do here is create a wonderfully rich and diverse cover for the large predators (one that camouflages a cougar, for instance, quite nicely) as they find their way to that ‘sumptuous smorgasbord’. This is a big topic and one that engages and enrages people depending upon their view and experience, of and with, the subjects. So here’s my story. I took a look around to see if I could spot anything and when I didn’t, I thought, ‘This is just paranoia creeping in, because you are alone on the farm without a dog (aka my early warning system).’ I went back to what I was doing. A few minutes later when the feeling would not go away, I decided that I had better listen to my instincts and head inside. I put on a pot of coffee and began to make my lunch. While filling the kettle I stared out the kitchen window at the new strawberry patch, and out from the long grass came the cougar. It was a big, full grown cat easily outweighing me. I called the Conservation officer right away and he came running, literally. I’m lucky to live right across the street from the office. He and a biologist came with the CO’s dog and tried to track the cougar, but to no avail. ‘Grass is too long,’ he said. That perfect cover for the cougar also meant he couldn’t be tracked! After lunch, I abandoned my Martha Stewart aspirations and got out my power brush cutter. As I mowed down the beautiful mixed grasses, wildflowers and lilies, I again got the feeling of being watched. This time I immediately came inside the house. Again, within a minute of my getting inside, out jumped the cougar. This time, he was headed back towards the CO’s office. Sure enough, a few seconds later his dog was barking excitedly and moments later the chase was on. Unfortunately, the CO and his one dog were not a match for the cougar and it got away. I say unfortunately, not because I want to kill cougars, but because I wanted that cougar killed. It has kept coming back and consequently, I no longer feel very safe on the farm. After that incident, I felt violated and unsafe in my own home. The feeling was akin to the feelings evoked by a home robbery I experienced in the city. Now I felt my personal space once again violated, but this time on a much greater scale. This cougar could cost me my life, or at least the life of some of my animals, and therefore my livelihood. There are many issues here, too many for me to deal with comprehensively in one post. For example, we should really have more than one Conservation Officer in this area. It is really dangerous work and they should not have to face these predators alone. But this issue in itself is huge, so I’ll leave it at that. Another is, and this will upset some readers, that this cougar should have been shot. These kinds of predators need to be ‘trained’ (or retrained, as the case may be) not to come where humans are. One of the reasons that the large predators are coming back into cities and generally to where humans are is that we are no longer shooting at them. Consequently, they no longer see us as an equal predator, or even as a threat. These animals have figured out that they can get away with being out in the day time, so every year there are more reports of them marauding on farms, and through garage bins in cities. If you don’t want to take my word for it, read the books by bear behaviour expert, Gary Shelton: Bear Attacks, Bear Attacks II, and Bear Attacks: Myth and Reality. The bible on the realities of bear encounters. As for me, the issue of predators directly affect my livelihood: we have lost several chickens to hawks and foxes, baby ducks to eagles and ravens, and the Mallard drake to a fox. As for fruit trees, the bears have broken branches off the apples and the pears. Some people say, ‘Just go out and buy some more’; ‘Why are you keeping fruit trees in bear territory? If you have animals and fruit trees then you are just asking for predators to come’; or (my personal favourite), ‘Well, you are in their territory.’ Am I really ‘in their territory?’ If so, isn’t all of the North American population? The reason we have the agricultural areas we do is because we’ve shot everything that moved there, and let them know they don’t belong here any more. It was a matter of survival and economics. After all, we all need to eat. This is a personal economic loss. I am trying to make my living at home by what I like to call ‘direct economics’. Instead of trading my time in an office for a wage and then going to the store and buying food, I want to close that loop. Not only do I feel this is personally important to me, but I believe it is the best way I can help the planet: my food miles are very short, I don’t have to travel to work, my animals are treated decently (some would say spoiled), and I’m not polluting the water table. Should I not have the right to own land where I chose to? To grow my own food, and make my living directly in this way? To own fruit trees and raise chickens and turkeys instead of making a wage and having to buy them? If so, then I also need the right to push back a predator in order to protect my livelihood. If not, I will be forced to move to an already over-populated area (but an area carefully depopulated of wildlife), get a job, and be once again rendered totally dependent upon an agricultural system that is ruining the environment (erosion, aquifer draining, desertification, water poisoning), mistreating animals, creating numerous diseases and mortal dangers for human consumers, and so on. When I sat down to write this morning, I actually didn’t intend to go off the way I did above. What I had intended to write about was a bit more of a good news story and I was surprised at the turn of the tenor. Now I know first hand how a story can take a life of its own (I used to be skeptical when writers would say things like, ‘I didn’t know the story would go like this, or like that’). Anyway, the good news is that mostly I do politick with the predators. After the cougar incident, we built more housing for the goats: by more, I mean more expensive and thus safer. In addition, I learned that when the bear comes and breaks branches on my apple tree, it is time to go pick all the apples as a preventative measure. I have also come to several agreements with the bears. When I do harvest all the apples, I make three piles: one for fresh eating, one for preserving and one for the bears. I take the last pile out to the spot where she enters the property and dump them there. I have found that over the course of a few nights, she will come and eat them all and not bother to re-enter the property. Also, I have several well established grape vines climbing on a pergola at the edge of the property; two green, two red. Every year a grizzly bear comes and eats the grapes. She likes the red but leaves me the green. She wrote up the contract and I signed on. To date, it is working nicely. 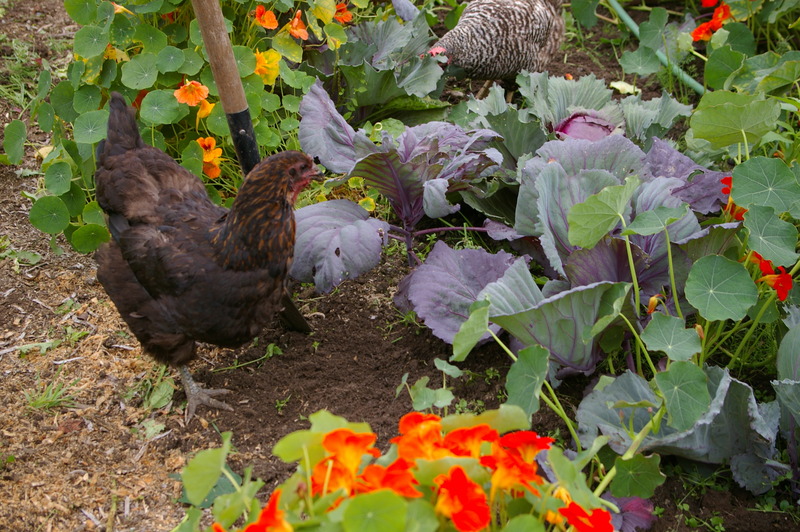 Chickens’ work is threefold: eggs, meat and to help turn the soil in the spring. I’ve concluded that everything my garden must have three functions. 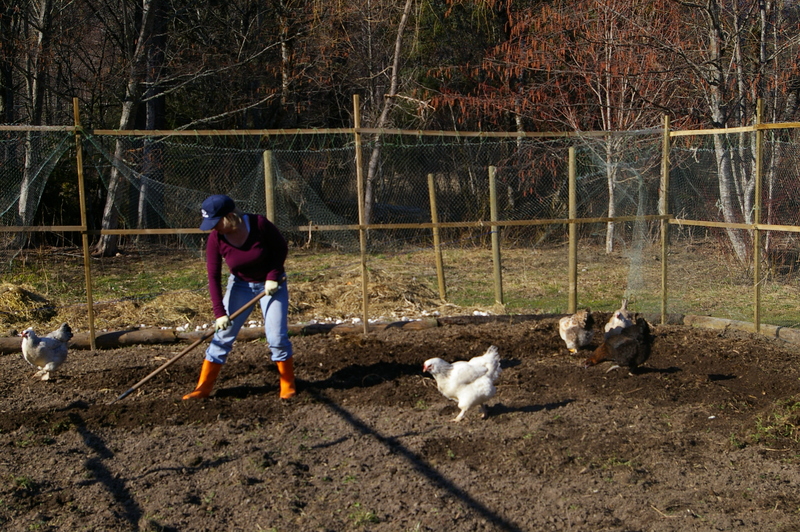 For example, chickens are my gardening helpers and free range at every opportunity. They eat the bugs and add their manure like I’m paying them to do it. They also provide eggs and meat. Ducks provide eggs and meat, and slug patrol. Helping with the beginning of fall clean-up in the garden. 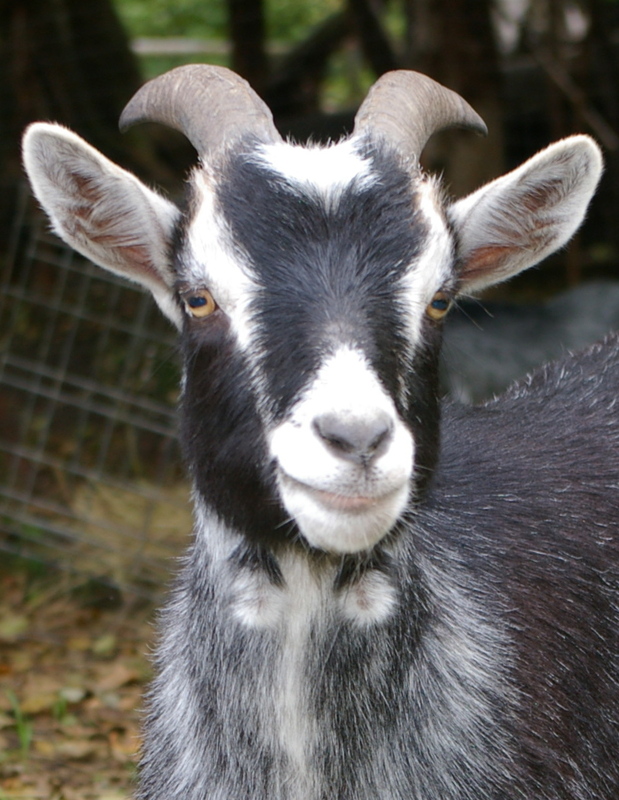 Malcom X, the baby of my goat herd. Goats here at Howling Duck Ranch are the ‘princesses’ of the farm. Basically, they don’t really pull their weight with respect to the permaculture principles. Thus far the goats help the fall clean up and clear undergrowth for our expansions; they clean their hay of seeds and then mix in their nitrogen. Primarily our goats are live lawn ornaments that provide great entertainment value: they are better than a crossword puzzle for keeping an alert mind. They will eat everything you don’t want them to and escape anything you try to keep them inside of. If you do spend time worrying about whether or not the goats are doing X, or Y, then that is exactly what they are probably doing! Farming is always dependent on the weather. This year (2008) has been our second poor summer in a row, so our production is down. Despite re-plantings, lettuce and spinach refuse to grow, spinach comes up with two real leaves and then promptly goes to seed and don’t get me started on the beans’ complete and utter refusal to participate in the project! In the valley we also have a serious predator problem: cougars, foxes, sparrowhawks, black and grizzly bears also share our property. Yes, grizzly bears can be a problem in a veggie garden, they love carrots and parsley! One invasion could destroy our herds or our garden. The neighbour has just lost his whole flock of chickens to a marauding dog. The dog actually broke a window to get in at the chickens. Then what? The bottom line says that all this effort is actually not worth it. Especially when the supermarket a kilometer away beckons seductively. My bottom line, I’ve learned this year that there has to be laughter and lots of entertainment (enter the goats). It has to be fun for me to be out there dawn to dusk, good weather and bad, unpaid. With my hunting license I will be able to have food sovereignty and food security, if I want it. But my fantasy of supplying all our needs except for olive oil and coffee I see now is a fantasy. Even with my husband’s help throughout the summer, we cannot achieve food sovereignty. Therefore I’ve moved to food security: I trade with other farmers in the valley (we practice the hundred meter diet, usually! ), the tapestry of our community is being woven tighter. And we (me and my farm) have become part of the community.